NASCAR mid-season grades and Chase predictions. With only a handful of races until the Chase for the Sprint Cup, we thought we’d give you our thoughts on drivers’ performances so far. Brian: A+, 1 pole, 1win, 9 top 5’s and 13 top 10’s. Cody: A+, a worst finish of 22nd, and has completed all but one lap the entire season. That’s big time. Brian: A+, 0 poles, 1win, 7 top 5’s and 13 top 10’s. Cody: A+, Could be even more of a threat now that he has that win under his belt. One of Junior’s bestseasons. 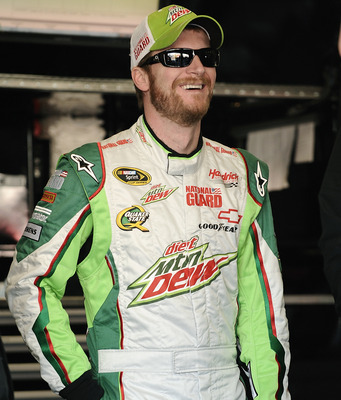 For the first time in a few years NASCAR’s most popular driver, has reason to smile. Brian: A, 2 poles, 1win, 8 top 5’s and 10 top 10’s. Cody: B+, Started offstrong, but looks to be losing some consistency as we move toward the Chase. Cody: A+, The 48 team looks to be back in championship form after last season’s defeat. Brian: A, 1 pole, 2wins, 8 top 5’s and 9 top 10’s. Cody: B+, A very streaky season for Hamlin. Has done well to position himself for the Chase. Brian: B+, 0 poles, 0wins, 3 top 5’s and 8 top 10’s. Cody: B, For whatever reason, I feel like Harvick is just lurking, ready to rail off a few wins at some point. Very quiet to this point though. Brian: A+, 0 poles, 3wins, 8 top 5’s and 9 top 10’s. Cody: A, Stewart is more of a second half driver. It leaves me to wonder whether roles have reversed this year or he will continue his winning ways throughout the second half. Could be scary for the competition if that’s the case. Brian: B, 1 pole, 0wins, 4 top 5’s and 9 top 10’s. Cody: B-, Hasn’t been able to make the most of his chances. Could have a win or two by now. Good season for Truex, but has to take advantage of opportunities if he wants to winthe grand prize. Brian: A-, 0 poles, 1win, 3 top 5’s and 9 top 10’s. Cody: A, Considering it’s his first year with this team, very impressive. If he can find that swagger and consistency he had before his win, he could be a threat. Brian: A, 0 poles, 3wins, 5 top 5’s and 8 top 10’s. Cody: A-, Has finished 8th or worse 13 times this season. Needs to run better more consistently. I expected more from him this season, but he could flourish in the second half. Brian: C+, 1 spot aheadof Wild Card, 1 pole, 0 wins, 2 top 5’s and 9 top 10’s. Cody: C, At least he’sin position to possibly still make the Chase… but wow. Who would have thought Edwards would only have two top 5’s? If he wins a race, that could get things moving. Brian: A-, Has 1st WildCard Spot, 2 poles, 2 wins, 5 top 5’s and 10 top 10’s. Cody: A, Has had fastcars all season, but overdrove them early, shown by his 4 finishes of 29th orworse in the first 6 races. Now that he’s comfortable with the organization, huge threat moving forward. Brian: B, Has 2nd WildCard Spot, 1 pole, 1 win, 5 top 5’s and 8 top 10’s. Cody: B, Not a great season for Kyle, but his phenomenal driving in the races he has not had issues has saved him a wildcard spot to this point. Brian: B-, 1 spotoutside of Wild Card, 0 poles, 1 win, 3 top 5’s and 5 top 10’s. Cody: B, In a contract year, Newman has done alright. I think this is about what everyone expected out of him. He’s a serviceable driver. I don’t think a championship driver though. Cody: B, A very quiet season for Menard, but he has stayed out of trouble for the most part. Better than what I was expecting from him. 13 finishes from the 10-20 range, with 4 top 10’s sprinkled in. Brian: C, 3 spotsoutside of Wild Card, 1 pole, 1 win, 2 top 5’s and 7 top 10’s. Cody: B, For being a third-car in a team other than Hendrick Motorsports, a 16th position is very good. Significantly improved from last year, Logano is showing consistency, while continuing to showcase his talent in the Nationwide series. 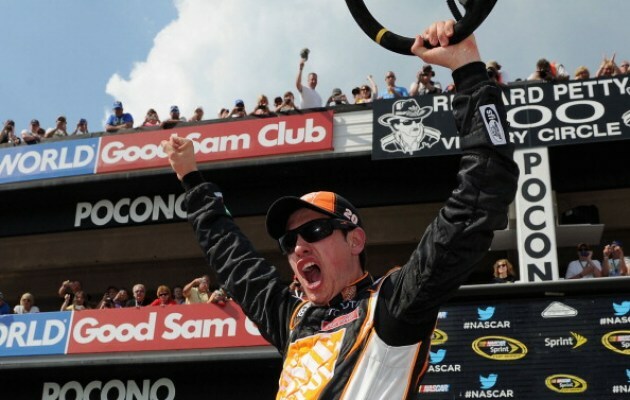 After a disappointing start to his career, Joey Logano has had a breakout season in 2012. Cody: D-, In second year with crew chief Alan Gustafson, Gordon was expected to be a title contender.Has had top 10 cars every week, just not the finishes to back them up, and that’s what is required. A lost season for Gordon. Cody: D, With the latest scandal, Allmendinger puts a damper on an already-dreadful season. The disappointment can be seen by looking at stats. 3 top 10’s. Considering this car was in victory lane multiple times last year, that’s embarrassing. Cody: B+, Highest in points of all lower-tier teams, and missed a race due to suspension. Also note that this is a team that had one (1) top 15 finish all of last season. Well done Kurt Busch. Yes, I think Tony Stewart will edge Jimmie Johnson for back-to-back Sprint Cup Titles and to keep Jimmie Johnson away from his 7th Sprint Cup Title. 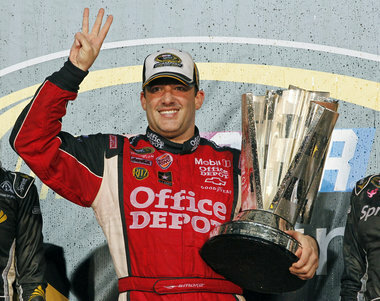 Brian believes that Tony Stewart will repeat as the NASCAR Sprint Cup Championship. How’s that for a bold prediction: A Hendrick showdown. 3 drivers battle for another championship for Mr. H. The longtime combination of Kenny Francis and Kasey Kahne pays off in their first year at HMS, as they become more lethal as the season progresses, overcoming the gap left by being a wildcard entering the Chase, and starting the new reign of Kasey Kahne. Cody talks about the eventful day at Daytona and Allmendinger’s suspension. Lap 21: Back from commercials, shows Clint Bowyer has passed Jimmie Johnson for 2nd, Jeff Gordon still has the lead. Lap 34: Back from commercials, Juan Montoya, Greg Biffle, Matt Kenseth, Clint Bowyer and more go to the pits, Kurt Busch takes the lead. Lap 35: Jimmie Johnson, Kyle Busch, Kurt Busch, Dale Earnhardt Jr. and more go to the pits, Brian Vickers gets penalty for entire pit road too fast, Martin Truex Jr. takes the lead. Lap 36: Martin Truex Jr. keeps the lead. Lap 38: Back from the commercial, it shows Martin Truex Jr. still has the lead. Lap 39: Martin Truex Jr. extends his lead for 1st on Clint Bowyer, Martin Truex Jr. keeps the lead. Lap 41: Martin Truex Jr. keeps the lead. CHECKERED (END OF THE RACE): Bowyer then takes a giant lead and suddenly, Tony Stewart passes Kurt Busch but it isnt enough! 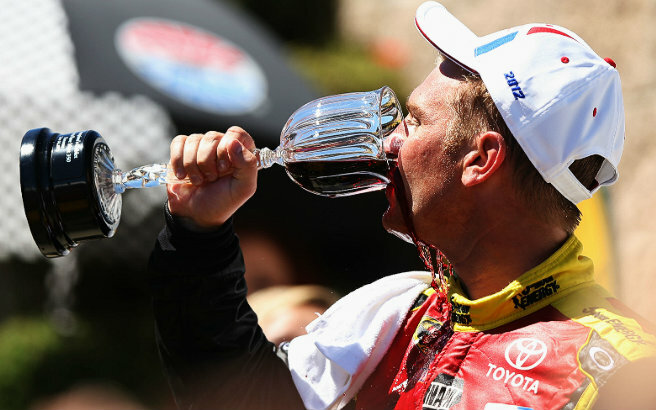 CLINT BOWYER OF THE 15 CAR, SPONSORED BY 5-HOUR ENERGY, WINS AT SONOMA RACEWAY IN SONOMA, CALIFORNIA! Do Road Course Ringers Still Have a Place in NASCAR? 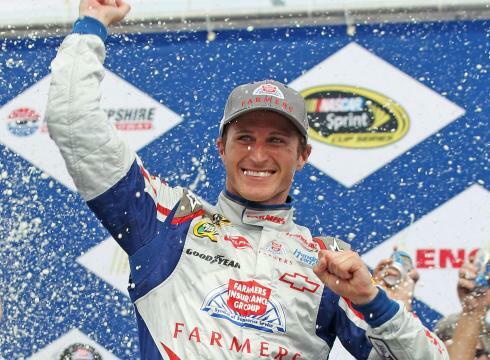 The competition in NASCAR’s top series is at a higher level than ever before. Sure, there may have been drivers that could match up against today’s Sprint Cup Series drivers. But let’s say a Richard Petty was in the sport today. He definitely would not have won 200 races. 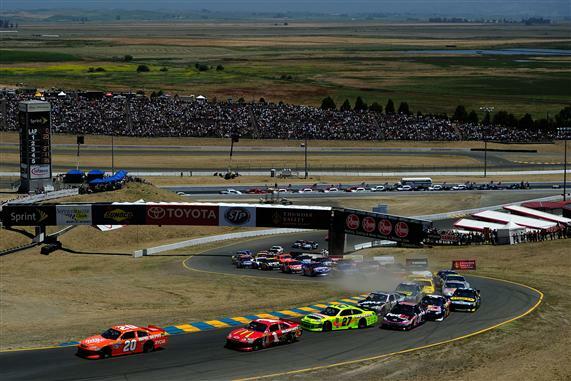 With Wisconsin’s Road America and California’s Sonoma (also known as Infineon) chalked up on the schedule this weekend, road course ringers will add another piece to the complex puzzle that is road course racing. In the Nationwide Series, road course ringers stand a chance to win the races because the level of competition is lower than that in the Cup Series. Ringers have advantages over Nationwide Series regulars because road course racing is all they do for the most part. They know how to feel out the car, breaking points, and where passing points on the track are. Also, ringers do not need to points race, allowing them to be as aggressive as they want to be. They may be going for the win, but ringers also suffer from overconfidence some of the time. Viewers have seen wrecked cars multiple times off the bumper of Jacques Villeneuve in the 2011 Nationwide Series races at both Road America and Montreal. They have also seen Boris said take out David Ragan and David Reutimann in the nasty wreck at Watkins Glen. Ringers need to think of other drivers, especially the ones that are racing for the points title, but in the mind of a racer, the goal is always to finish in front of as many opponents as possible. This applies more toward the wreck involving Said because he was running around the back of the pack when it happened. In the case of Villeneuve, he was going for the win. Robby Gordon is the last driver classified today as a “road course specialist” to have won in the cup series. At the time he swept both Sonoma and Watkins Glen in 2003, he was racing full time at RCR. This brings me to my next point about the large difference between ringers in the different series. Ringers are able to be more competitive in the Nationwide Series than the Cup Series because they have better quality rides. In the top series, owners cannot afford to substitute a ringer into their car because it would put a huge damper on that driver’s points performance on the season. The rides the ringers get, normally start-and-park cars and ones that run toward the back of the pack, are not to the standard of the top teams in the sport. In the Nationwide Series, it is different. Some of the top series’ top cars, such as Penske’s No. 22 and JGR’s No. 18 and 20, are not manned by the same drivers every week on ovals. Therefore, the owners can afford to stick a ringer in the driver’s seat because they are only going for owner’s points in the series. In that case, only the car number matters, not the person who is driving it. With better equipment available, combined with less driver skill and less experience, we generally see ringers be more competitive on the road courses in the Nationwide Series. Compared with Gordon, who was not even a ringer at the time he won, the last time a ringer won in the highest-tier developmental series was Said at Montreal in 2010. As we can see in the first practice session’s speeds, Villeneuve, Nelson Piquet Jr., Max Papis, Michael McDowell and Ron Fellows, all with road course racing backgrounds, were the top 5 drivers. Each of those drivers does not regularly race in the series. Conversely, in the first Cup qualifying session, the first ringer we see on the chart who has not competed full-time in recent years is Said in 32nd position. Road course races used to be something some teams just threw by the wayside. Now that the sport’s competition level is higher than ever, every team is forced to put their all in and dedicate themselves to get better at these race tracks, putting even more of a damper on the ringers’ chances of victory. The familiarity of the car is more important than the feel of the course some of the ringers, who must make the transition to lightweight sports cars to bulky, heavy, over-powered stock car, may have. Ringers may be a solution for underfunded teams to bring home a decent finish with the car in one piece, but young, inexperienced drivers are not going to get any better at road course racing unless they get the experience.